WASHINGTON (CNS) – Nearly a year ago, Hurricane Maria slammed into Puerto Rico as a category 4 storm, and afterward 11-year-old Marco Lebron’s first thought was about the monks who teach at his school, Benedictine-run San Antonio Abad School and Abbey in Humacao. Helping the monks get water was one of the first things Marco and his father, Jose Lebron-Sanabria, set out to do in those first days after Maria; that and take care of their own family’s water needs. Lebron-Sanabria and his wife, Christina, also have a daughter, Natalia, 2. He had even more people to help as a member of the Knights of Columbus and general insurance agent for the fraternal organization. “We are getting back on our feet step by step,” Lebron-Sanabria told Catholic News Service in a phone interview from Humacao. As of Aug. 14, nearly 11 months after the storm, 100 percent of the customers who lost power have had electricity restored, ABC News reported. By mid-summer, he saw real improvement. “But we still have a long way to go,” he added. Lebron-Sanabria, Marco and Abbot Rivera recalled what conditions were like immediately after Maria hit Sept. 20 in interviews for a Knights of Columbus video in its “Everyday Heroes” online series. 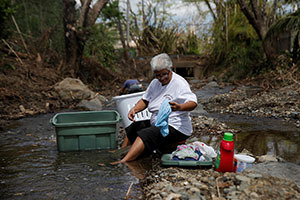 The Knights were among the entities donating funds for Puerto Rico’s recovery; relief for the island was part of the $7.5 million the organization gave in disaster aid in 2017. In the video other Knights describe what life is like post-Maria and the kind of material help they and others have pitched in on to help their fellow residents. In a report to Congress in August, Puerto Rican officials put the death toll at 1,427, with most of the deaths coming in the days and weeks after the storm. With emergency services stretched and transportation hindered by downed power linings blocking the roads, people could not get needed medical attention and perished. Lebron-Sanabria has been a Knight since 2011 and became an insurance agent in 2014. Three years later the Knights named him general agent for Puerto Rico. In that role he became a central leader in relief efforts after Maria. “My job as general agent is to take care of people with good financial advice so they can protect their family’s economic future,” he said. Jose Lebron-Sanabria told CNS he has never experienced anything before like Hurricane Maria and the devastation it caused to the island. “(What) we’ve been through is very difficult to express,” he said. He feels his lifelong Catholic faith has helped him stay strong and truly believes feels Knights founder Father Michael McGivney has been looking out for all of them.